Morning fog means seed catalogs on the table, coffee in my cup, spring in my step. Fog has insinuated its steely cold embrace on the island, persuading me to just stay inside until our sleepy January sun rises to a height of full muster. At the table, I’m snug in a favorite old sweater, one with more wool in the pilling than in the weave, and surely on the verge of revealing an elbow or two. At my feet, bundled bulldogs snore in unison like mumbling metronomes. Wicked warm slippers save my bare feet from cold bare wood floors, and a cup of joe promises to keep me toasty on the inside once it cools itself down on the outside. Before me a stack of seed catalogs teases with vibrant colors and the promise of future bounty: the perfect January morning. Eye candy that’s good for you. Links provided by clicking company names. With over 1400 heirloom seeds available, and photos that I swear were taken by an out-of-work pin-up photographer, Baker Creek tops my list of seed catalogs that make you salivate. As much coffee table book as catalog, there is not a page portrayed that is not ripe with the passion of growing great things and discovering new and forgotten varieties. Baker Creek Seeds Catalog: so pretty it makes you want to eat all your vegetables. For everything the Baker Creek catalog is, FEDCO is not. And therein lies its charm and power to woo you; it looks, feels and reads like some dog-eared treasure found in an a dusty attic chest. Sketches, vintage etchings, descriptions, expert advice and humor are replete on each page in a chockablock fashion that compels you to make sure you didn’t miss a thing. Here’s another great seed seller who gives you the opportunity to buy smaller quantities at lower prices. I like to grow a lot of varieties, so this affords me greater range in the garden and on the table. The catalog also has a seed section for Asian, French, Italian, Middle Eastern, and Latin-American vegetables as well as dyeing and medicinal herbs. Pinetree Garden Seeds always carries some culinary gems. This engaging catalog is a fine little work of art with Beatrix-Potter-like paintings of vegetables suitable for framing or decorating the warren of Peter Rabbit. You’ll find great descriptions, interesting varieties and seed amounts clearly shown. And if you’re a flower fanatic, wait until fall and be blown away by their bulb catalog: Beauty from Bulbs. A non-profit, member-supported organization that saves and shares the heirloom seeds, Seed Savers Exchange (SSE) really put heirloom seeds and seed-saving on the map. The catalog and website are first rate, offering plant diversity rarely seen in other catalogs. SSE supplies me with seed for my favorite cool-weather watermelon: blacktail mountain. Territorial Seeds is a well known and respected seed catalog from the Pacific Northwest gardener and grower, a catalog that covers an amazing array of seeds tested in and for a climate where cloudy skies outnumber clear days. Territory Seeds turned me on to my favorite French pole bean: Fortex — a curious name for an outstanding green bean. 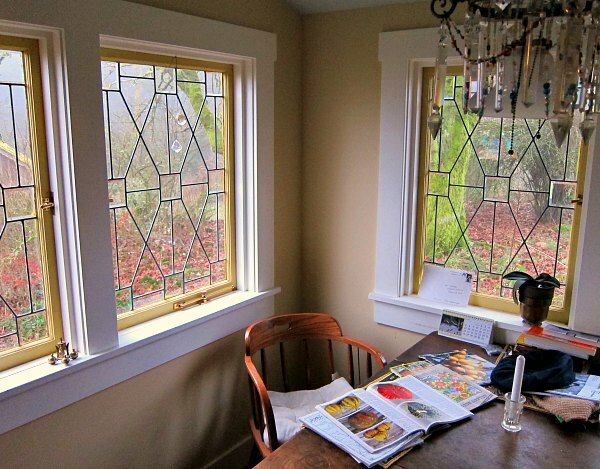 Artistic Gardens offers a seed catalog on a shoestring, but don’t let that fool you. As a loyal fan, I like their seeds because they have really inexpensive packets of seed sampler packets available. So if I want to try new varieties out, I can do so without breaking the bank. I mean who really needs 1,000 chard seeds. Packet prices range from 35 cents to $1.00 and they have exceptional shallot sets. 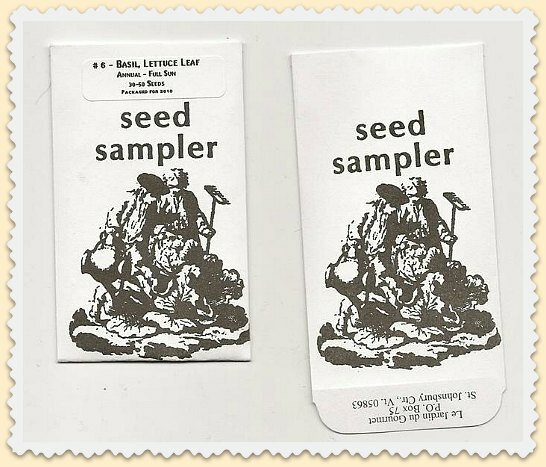 Artistic Gardens, Le Jardin du Gourmet sells seed sampler packets, a great way to try different varieties without spending a lot and buying too much seed. My friend Anne is paying attention. I forgot to include Johnny’s Seeds on my list of favorites, so I’m here to correct that omission. As she said in her comment, “I have to put in a good word for the good folks up in Maine at Johnny’s Selected Seeds (www.johnnyseeds.com) Do order a catalogue!– you’ll be glad of it. In addition to carrying loads of things to grow, they’re breeders who have won a number of AAS awards (I can attest to the excellence of their Sunshine, Confection and Black Forest squashes), they design tools, and their catalogue is such a trove of information that you feel like you’ve completed an agronomy course just by studying it (I like people who make me feel smarter). Plus, they’re employee-owned and strictly non-GMO. Their website is full of useful stuff, too…I’ve been buying from them for probably close to 20 years, and know a lot of commercial farmers who prefer their seed, as well.” Thanks Anne, sometimes I need supervision. What’s your favorite seed catalog? 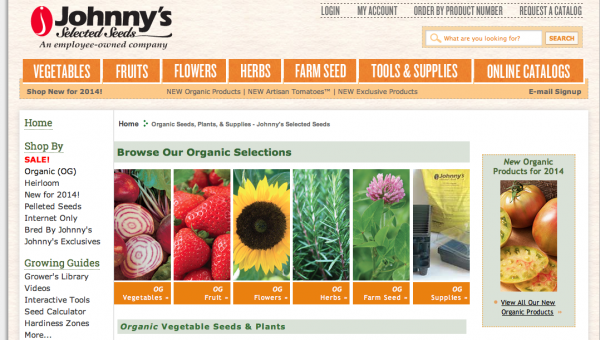 I have to put in a good word for the good folks up in Maine at Johnny’s Selected Seeds (www.johnnyseeds.com) Do order a catalogue!–you’ll be glad of it. In addition to carrying loads of things to grow, they’re breeders who have won a number of AAS awards (I can attest to the excellence of their Sunshine, Confection and Black Forest squashes), they design tools, and their catalogue is such a trove of information that you feel like you’ve completed an agronomy course just by studying it (I like people who make me feel smarter). Plus, they’re employee-owned and strictly non-GMO. Their website is full of useful stuff, too…I’ve been buying from them for probably close to 20 years, and know a lot of commercial farmers who prefer their seed, as well. A Local company from Ellensburg. Irish Eyes Garden Seeds. Organic. Worth a look! Thanks Cindy and Sal, great suggestions! http://www.bountifulgardens.org/‎ Bountiful Gardens in Willits, California..
And if you really want to experience Garden/Seed over stimulation..www.theheirloomexpo.com/‎..Which many of these seed companies exhibit at..Oh Myyyyy ! Tom – Seeing the Territorial Seed Catalog brought back some great memories of the Cosmos Flowers we used to plant at our Westside House over 20 years ago now. I used to have the same winter dreams of seeing them waving in the breeze by just seeing the photographs in the catalog. Thanks for this wonderful piece today! Been enjoying your blog for several months now. Thank you! One of my favorite seed sources is The Sustainable Seed Company out of Northern California. Always great customer service and great products. Heirlooms, non gmo’s , cover crops etc. My sister received the new Burpee catalog which has a stunning new beefsteak tomato on the cover. I know, Burpee is very mainstream and much more commercial but hey, it’s been the backbone of the home gardener for generations now and helps a lot of gardeners transition over to more intensive heirloom cultivation. Just sayin’…. Otherwise, you and I have pretty much the same catalogs on our tables! Here in Southern Ca I have some tomato and pepper starts coming up and we’re finishing up the winter/early spring planting like cabbages, cauliflowers etc. Been a very warm winter and it’s only going to get hotter so onto the heat tolerant plants. Yes, the enjoyment of a quiet morning perusing the catalogs and start of the planning. The true pleasures of life. What a lovely corner to embrace the morning! I love Kitazawa…but I can’t grow anything in there as most of it needs longer growing season. I pile the catalogues up on the coffee table and think of the promises of the season to come. I had to go through the Spring album today to convince myself that this 10 ” of snow will go away (someday) and the wild berry patch will produce millions of babies…its just her gestation period is too long : ). Do you ever get snow there? Hi Hafiz, we get very little snow. The Puget Sound basin rarely varies 10-15 degrees in the winter, holding between the high thirties and high forties. When it does snow, everything stops (lots of hills) and Seattle takes a snow day usually. If you like snow it’s only an hour away to our nearest mountain pass and ski area. And If it’s any consolation, I have an entire day or two ahead of me fighting back blackberry brambles. Here’s the promise of spring! Bakers Seeds, Botanical Interests, Seeds of Change, and Southern Exposure Seed Exchange are my favorites. They all carry organic, non-GMO seeds with high germination rates and none of the seeds are supplied by Monsanto owned companies. SESE is a great source for mid-Atlantic gardeners. Swallowtails Seeds are also fabulous. Btw, I am super-sugar-snap-pea green with envy that you have your Territorial Seed catalog already, Tom! I haven’t gotten mine yet, and I live in Oregon! Great list! I’d add West Coast Seeds up in Vancouver. They specialize in non-gmo, op varieties, many grown organically. Good selection for the PNW (www.westcoastseeds.com). So glad to get this list of seed catalogs. I’m ordering right now! Anyone in the pacific northwest should really have a look at Adaptive Seeds, Peace Seeds/Peace Seedlings, and Wild Garden Seeds. These smaller companies are doing their own regionally-adapted breeding work and offer some of the most interesting varieties for this climate. Thanks Bill, that is a really great tip. I’ll add them to the list! Thanks again! And your site is fantastic, I look forward to spending some time learning a few things from you. Cheers, and happy growing! Well, duh — the link I tried to add shows my name, rather than the name of the wonderful seed company, Seeds Trust/High Altitude Gardens. Tom, can you fix this? so sorry. Hi Kathy, no problem, I’ll fix that ASAP. Tom, I love your blog — wish I had more time. (nobody EVER said that before, right?) This is late in the season of course, but I absolutely love to read seed catalogs too. I lie in bed an night with 3 or 4 of my favorites — Baker Creek, Johnnies, Territorial and Fedco and a few others here and there. The possibilities are endless and it’s difficult not to go nuts. I read the reviews too. I especially like Baker Creek for all the interesting varieties of squash and peppers — oh, and tomatoes of course. Not doing much this year because I moved in mid May, but the good thing is we have a longer growing season in California, so we’ll see how it goes. Thanks for the blog love, Miss Cindy! I’m in your camp, love to read seed and nursery catalogs. And I’d say you still have time to plant. I’m really late this year, but you know it always works out it seems. One of my favorite farmers (no longer with us, sadly) used to plant corn here in mid-June and have the best, sweetest ears by late September. So go for it, and plant a few things to keep that thumb green and growing. I’m planting some acorn squash seeds today in fact. Thanks, Tom. I was pretty bummed when I missed out on the usual spring planting and then of course busy with moving, then I just thought it was too late so I did nothing. I have seeds already, so I’m just going to plant! Tomorrow. Thanks for your encouragement, Tom.